It's been a great winter for riding here in southeastern Massachusetts so far and I have gotten many hours on the winter/cyclocross bike, but still, the rollers are the necessary evil of the off-season. I haven't figured out yet what it is I am training for, maybe just to lose a kilo or two, or maybe I'll actually race this year when I am not behind the microphone. Either way, the early evening darkness and the temperatures keep me off the road more than on it and the rollers are the only alternative. But they are godawful boring and my genitalia fall asleep after 20 minutes. There, I said it!! The only thing that gets me through it, and always has, is Phil Liggett. I've been vicariously competing in the 1994 Paris-Roubaix via VCR during the last few roller sessions and Phil's commentary is always spot on. I expect to win the race alongside Andrei Tchmil the next time I ride indoors. And Phil is going to make the call -"Here is the cagey American veteran literally towing Andrei Tchmil into the velodrome. Both of these men have been riding as if their lives depend on it since the snow started in Compiegne. I just hope the American has enough left in him for the sprint because he has been doing all the work since their two man breakaway started 3 hours ago and he deserves the victory etc. etc. etc." I have always had Phil's commentary in my head while riding on the road, especially during July. Even more so on the rollers. We all do what we have to to stay motivated this time of year. Imagining Phil Liggett calling my name and describing my every move in the winning breakaway is my thing. 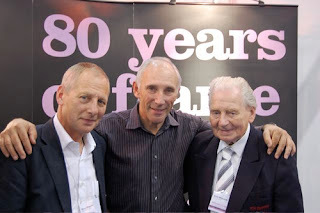 The king, nay, god, of all cycling announcers, Sir Phil with two other blokes. Only a few more weeks until day light savings time starts (thanks George W. Bush). I too would love to hear Phil Liggett narrating my cycling feats, but how likely is that when the only race I do is the George Street Bike Challenge for Major Taylor? I do have a grainy old photo of me & Phil at the 1996 Olympics that I'll send you off-blog.